Any question at all, we're here to help. In addition, our wooded campus in Woolwich, Maine is sometimes closed during winter snow storms or without power during inclement weather. If these conditions exist, please call ahead. We want to assure the safety of our staff and customers. Where is the Shelter Campus and Store? 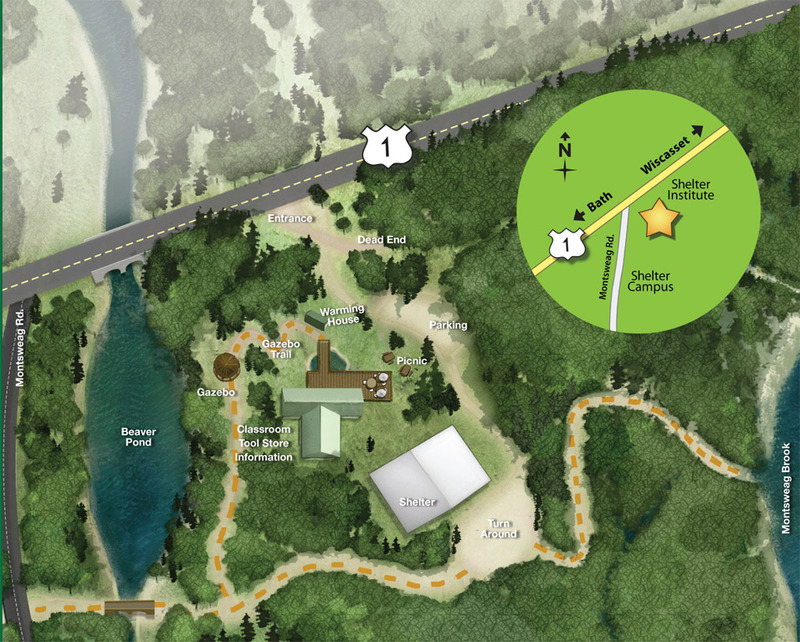 The Shelter Campus is five miles north of Bath and five miles south of Wiscasset. The closest airport is in Portland, 45 miles south. Students also fly into Boston, MA or Manchester, NH—each of these is 2-3 hours driving time. Train and bus service is available to Portland or Brunswick (20 minutes south). Our campus is situated on 68 acres of wilderness with hiking trails that lead to salt-water estuaries and great canoeing. Visitor activities include hiking, fishing, bird watching, trail clearing, tree/plant identification and arborist demonstrations. The Midcoast area offers an excellent variety of accommodations, shopping, museums, art galleries and food from Wiscasset to Bath and Brunswick and down the peninsulas to Boothbay Harbor, Popham Beach or Reid State Park. Our campus location provides easy access to the entire area.